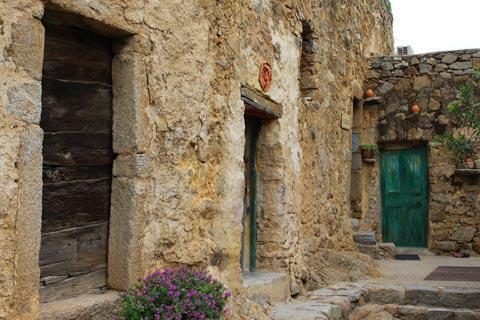 Pigna is a very small village in the Balagne region of Corsica, northeast of Calvi. It is quite charming and an hour spent exploring the village is very pleasant. 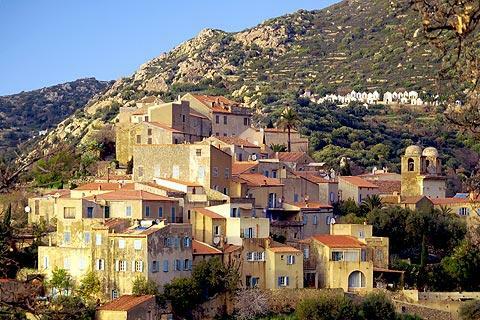 The village can date its history to the 9th century when Lieutenant Consalvo was sent here by the Pope to free Corsica from the Saracens. Consalvo built a tower and called it Pigna, after the region of Rome where he came from. 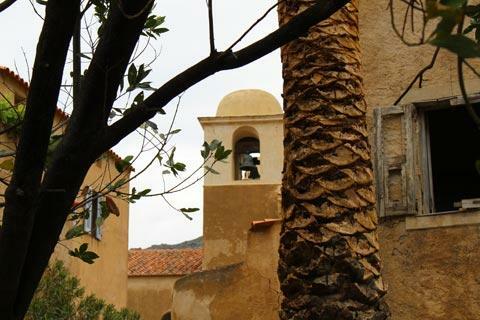 Before you even reach Pigna you will have caught glimpses of the village through the trees, enticing you to want to explore and provising some of the best photo opportunities. There is a car park just as you enter Pigna: a small charge is payable and parking is obligatory because the village is pedestrianised. 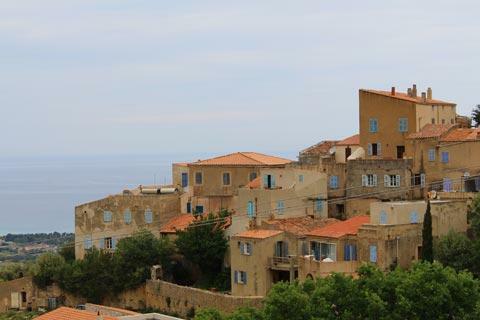 France This Way comment: Pigna seems almost totally ignored by travel guides but we thought it was one of the loveliest Balagne villages and recommend you visit as part of your tour of the region. 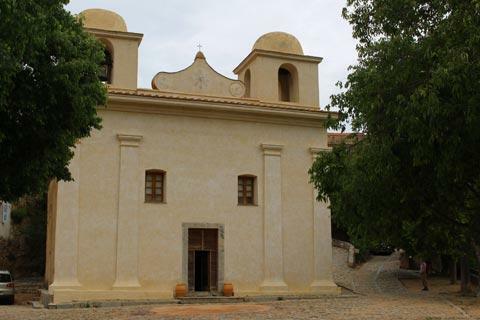 You quickly find yourself in the main square, facing the church. The Church of the Immaculate Conception is rather plain from the front, with four pilasters and two small towers being the principal decoration. 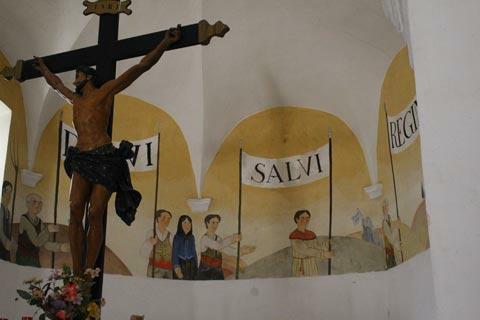 Inside the church there is a recent mural around the choir section and also two paintings from the 17th century. From the main square you can follow the path to the right of the church which leads around the village. Along the cobbled paths you will see a few small courtyards and streets of ancient houses, as well as a pottery shop with some lovely pieces of art and several music and crafts related shops. The local blue shutters are another traditional feature. 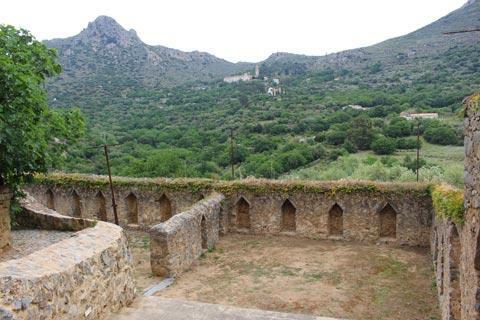 One interesting sight as you explore is an open area surrounded by stone walls which is the Enclos A Vaccaghja. Originally a cattle enclosure, this is now listed as a Historic Monument. 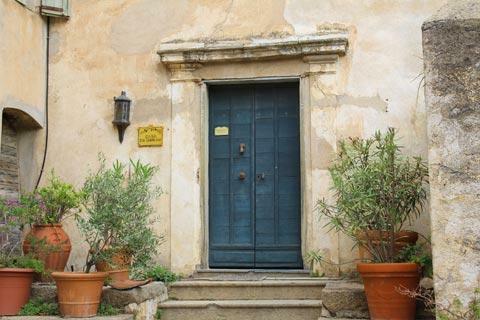 After enjoying your stroll through Pigna you will find a hotel-restaurant in the village centre and a cafe next to the car park. 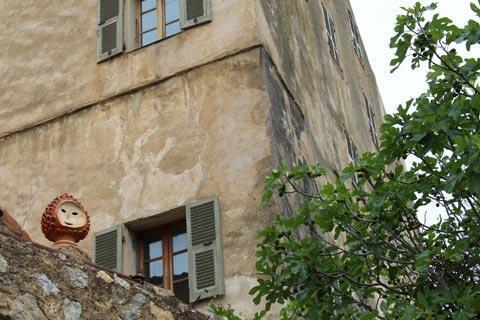 Music is central to life in Pigna. The village spent much of the middle of the 20th century falling into disrepair before an association was formed in the 1960's to renovate the houses and form a community of musicians and artists. This was very successful and led to the renovation of many houses in the village, and a musical tradition that survives today based around chants and polyphonic music. The auditorium in Pigna is built from compressed earth using traditional techniques and was completed in 2000. It is regularly used for music concerts. 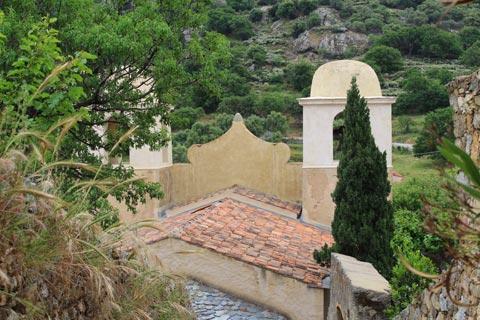 If you don't have time for a major tour of the Balagne villages, we suggest you visit Corbara, Pigna and Sant'Antonino: these three are good examples of the villages and are all quite close together and near the coast road from Calvi to l'Ile-Rousse.